Background The UK government plans to extend the opening hours of general practices in England. The ‘extended hours access scheme’ pays practices for providing appointments outside core times (08:00 to 18.30, Monday to Friday) for at least 30 min per 1000 registered patients each week. Objective To determine the association between extended hours access scheme participation and patient experience. Methods Retrospective analysis of a national cross-sectional survey completed by questionnaire (General Practice Patient Survey 2013–2014); 903 357 survey respondents aged ≥18 years old and registered to 8005 general practices formed the study population. Outcome measures were satisfaction with opening hours, experience of making an appointment and overall experience (on five-level interval scales from 0 to 100). Mean differences between scheme participation groups were estimated using multilevel random-effects regression, propensity score matching and instrumental variable analysis. Results Most patients were very (37.2%) or fairly satisfied (42.7%) with the opening hours of their general practices; results were similar for experience of making an appointment and overall experience. Most general practices participated in the extended hours access scheme (73.9%). Mean differences in outcome measures between scheme participants and non-participants were positive but small across estimation methods (mean differences ≤1.79). For example, scheme participation was associated with a 1.25 (95% CI 0.96 to 1.55) increase in satisfaction with opening hours using multilevel regression; this association was slightly greater when patients could not take time off work to see a general practitioner (2.08, 95% CI 1.53 to 2.63). Conclusions Participation in the extended hours access scheme has a limited association with three patient experience measures. This questions expected impacts of current plans to extend opening hours on patient experience. Practices participating in the scheme are advised to set their opening hours using results from the General Practice Patient Survey—an annual national study of adults registered with a general practitioner (GP).18 ,19 Overall experience and experience of making appointments as reported in the survey are monitored nationally as part of the NHS outcomes framework.20 Questionnaires also ask about patient satisfaction with opening hours. This provides the opportunity to examine the association of the extended hours access scheme with several patient experience measures that national policies presume will be affected by extended opening hours, particularly for people unable to take time off work. No studies have previously determined this association. The impact of opening 7 days a week is also largely unknown. 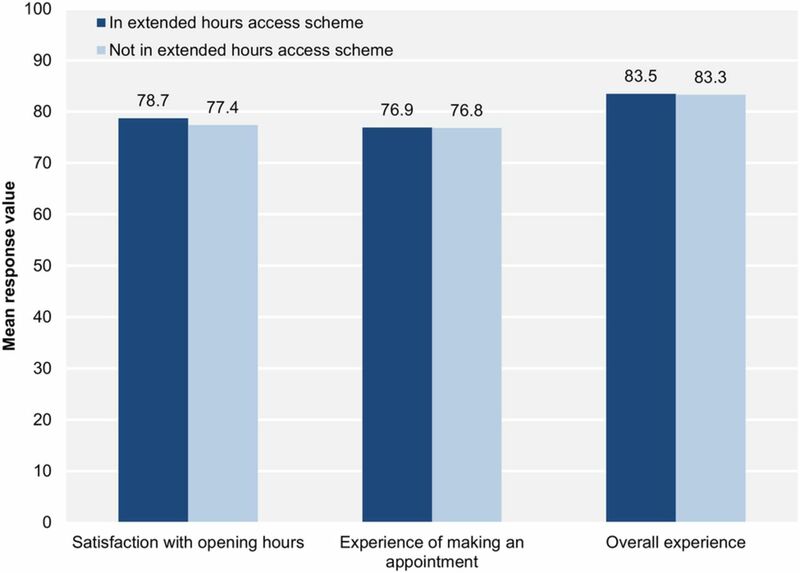 We examined whether patients registered to general practices participating in the extended hours access scheme report a better patient experience across three measures from the General Practice Patient Survey—satisfaction with opening hours, experience of making an appointment and overall experience. We also examined whether the associations varied by patient ability to take time off work to see a GP. Payments made to each general practice under the extended hours access scheme 2013–2014 were obtained from the Health and Social Care Information Centre.26 Practice-level data on general practice payments became available for the first time in February 2015 and are not provided for financial years (April to March) before 2013–2014. Payments are extracted from general practice computer systems and validated against statements for each quarter of the financial year.26 Data on the extended hours access scheme were available for 99.7% (7981/8005) of practices in the General Practice Patient Survey data. We considered practices that received a payment under the scheme to be scheme participants. All other practices were classed as non-participants, thus creating a binary variable. We could not measure the number of extended opening hours provided over the minimum requirement (30 min per 1000 registered patients) as payments are based solely on the number of patients registered to each practice (multiplied by £1.90). Participating practices provide appointments outside of the core hours given in their main contracts. Standard core hours are from 08:00 to 18:30, Monday to Friday, for the 95% of practices with General or Personal Medical Services contracts.27–29 We excluded the remaining practices as they often open for longer as part of their main contracts,30 so not participating in the scheme does not indicate shorter opening hours for them. We estimated the association of participation in the extended hours access scheme with the patient experience measures using three approaches: multilevel random-effects regression, propensity score matching and instrumental variable analysis. These methods are robust under different assumptions, as explained in detail elsewhere.42 In each approach, estimates were adjusted for the 12 patient and practice characteristics given above. We adjusted SEs for heteroscedasticity and clustering within practices. The random-effects regression models assume that all characteristics of patients and practices that are associated with both scheme participation and patient experience were observed and adjusted for in the models. If this assumption is false, the estimated coefficients will be biased by residual confounding. Some other biases potentially affecting the regression estimates, from misspecification of the form of the outcome equation for example, can be resolved by matching methods.42 We therefore used propensity score matching to assess the sensitivity of the results. We used logistic regression to estimate the probability that a respondent's general practice participated in the scheme (the propensity score) based on the 12 patient and practice characteristics given above. Each respondent whose practice did participate was then compared with 100 other respondents with the most similar propensity scores whose practices did not participate (nearest neighbours matching with replacement);43 matching with 100 respondents rather than the one most similar respondent improved the balance of variables between the participant and non-participant groups. We excluded respondents with no suitable match (due to non-overlapping propensity scores). We used standardised mean differences in patient and practice characteristics between participation groups, before and after matching, to assess matching quality. The above approaches assume that all variables associated with scheme participation and patient experience are observed and can therefore be accounted for in the models. However, it is plausible that participating practices provide other additional services that we do not have data on but that also affect patient experience, causing estimates to be biased. Instrumental variable analysis can resolve this issue if a valid instrument can be found. CCGs are groups of general practices (38 on average across 211 CCGs) that plan and commission local health services in England. The percentage of practices that participate in the extended hours access scheme varies considerably across CCGs (10th centile=45%, 90th centile=96%), reflecting different ‘preferences’ of CCGs as largely autonomous organisations. CCGs have a legitimate role in directly influencing member practices on issues such as access, while GPs often feel that their views are not reflected in CCG decisions.46 It is plausible that CCGs with similar local populations and practices can have very different views on the extended hours access scheme. This may be due to large variation in governance arrangements of CCGs, their levels of engagement with member practices and who ‘owns’ decision-making.46 We examined the association between scheme participation rates within CCGs and practice characteristics to help evaluate instrument validity. We used two-stage least squares to estimate the effect of the scheme. We report partial R2 and F statistics from the first-stage regressions to assess instrument strength. Assuming that the instrumental variable does not modify the effect of scheme participation, the average effect of the scheme on scheme participants is estimated (as for the other two approaches). Table 3 describes the 903 357 respondents to the General Practice Patient Survey 2013–2014. Most people were in paid work (57.1% of weighted responses) with a minority unable to take time off work to see a GP (18.7%). Table 4 shows that most respondents were very satisfied (37.2%) or fairly satisfied (42.7%) with the opening hours of their general practices. Results were similar for experience of making an appointment and the overall experience. Table 5 indicates that working people, particularly if they were unable to take time off work to see a GP, reported worse experiences across measures. Mean values of satisfaction with opening hours, experience of making an appointment and overall experience at the practice level were 78.5 (SD 6.3), 76.8 (9.4) and 83.1 (6.5), respectively. Most of the included general practices participated in the extended hours access scheme in 2013–2014 (73.9%; 5492/7428). The mean payment to participating practices was £10 454 (IQR £5863–16 772). Participation rates and other characteristics of General Medical Services practices were comparable to those of Personal Medical Services practices (see online supplementary appendix 1). Figure 1 shows how mean values of the patient experience measures did not differ much by scheme participation. Table 6 presents estimates of adjusted mean differences, from random-effects regression, propensity score matching and instrumental variable analysis. Mean satisfaction with opening hours, experience of making an appointment and overall experience by scheme participation. In the multilevel random-effects regression models, respondents registered to general practices participating in the scheme reported greater satisfaction with opening hours on average (mean difference 1.25, 95% CI 0.96 to 1.55). The standardised mean difference of 0.28 indicates a small association with satisfaction. The scheme was estimated to have minimal associations with experience of making an appointment (0.48, 0.07 to 0.90) and overall experience (0.32, 0.04 to 0.60); the mean differences correspond to 0.07 SDs in these measures of patient experience at the practice level. The association of scheme participation with satisfaction with opening hours differed according to respondent ability to take time off work to see a GP (p<0.001 for joint test of interactions). Table 7 shows a greater association for those unable to take time off (standardised mean difference 0.47) compared with respondents who were not in paid work (0.20). There was no evidence of this effect modification for experience of making an appointment or overall experience (p=0.315 and 0.788). Figure 2 presents how the association for satisfaction with opening hours varied by region of England (p<0.001). The largest association was seen for the East of England (mean difference 3.58, 2.66 to 4.49), while there was no evidence of an association in London (−0.27, −1.12 to 0.58; p=0.531). Mean differences typically remained minimal across regions for the other two experience measures (see online supplementary appendix 2). 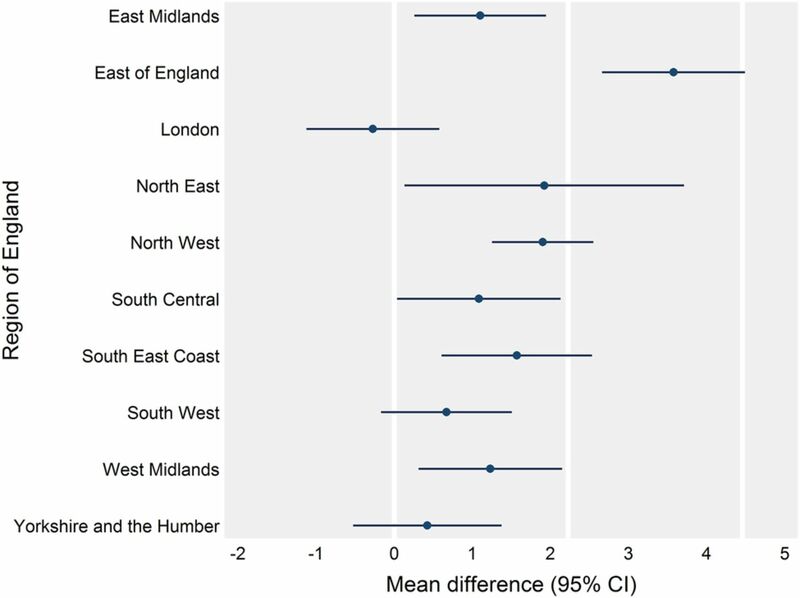 Associations of the extended hours access scheme with satisfaction with opening hours by region of England estimated using multilevel random effects regression models. Plotted estimates are adjusted mean differences and bars represent 95% CIs. Reference lines are at 0, 0.5 (2.23) and 1 (4.46) SDs in satisfaction with opening hours at the practice level (see table 6). Respondents who were unable to take time off work to see a GP or were not at all confident in managing their health reported substantially worse patient experiences (mean differences relative to those not working or those very confident in managing their health ≤−7.96; see online supplementary appendix 3). For example, mean satisfaction with opening hours for respondents who could not take time off work to see a GP was 14.62 (14.40 to 14.83) lower than for respondents who were not working. Patients who could take time off to see a GP responded more similarly to those not working across measures (eg, satisfaction with opening hours −3.68, −3.82 to −3.53). General practices were more likely to participate in the extended hours access scheme if they had larger registered populations (OR for an SD increase 1.26, 1.18 to 1.35) or performed better in the Quality and Outcomes Framework (1.22, 1.15 to 1.28; see online supplementary appendix 4). Scheme participation was highest in the northeast of England (relative to East Midlands, 5.51, 3.85 to 7.90). Before matching, the largest standardised mean difference in a variable between the two participation groups was 18.5% (percentage of respondents in the north east of England); most variables were highly balanced (average standardised mean difference 4.5%). Using propensity score matching, participation in the extended hours access scheme was associated with a 1.35 (1.00 to 1.70) increase in satisfaction with opening hours (table 6). This estimate and those for the two other experience measures were similar to those from the random-effects regression models, thus supporting the specification of these regression models. Propensity score matching, in general, reduced the standardised mean differences in characteristics of the two participation groups; the average difference reduced to 0.5%, indicating good matching quality (see online supplementary appendix 5). A suitable match could not be found for a very small number of respondents (0.09%). The percentage of practices that participated in the scheme varied from 34.9% to 96.0% across categories of the instrumental variable (fifths of the percentage of practices participating in the scheme in each CCG). This variable explained 18.5% of variation in the probability that a respondent was registered to a participating practice (partial R2=0.185; F statistic ≥1702). Other characteristics of general practices were generally similar across categories of the instrumental variable (see online supplementary appendix 6). In the instrumental variable analysis, the estimated effect of scheme participation on mean satisfaction with opening hours was 1.36 (0.71 to 2.00) with a corresponding standardised mean difference of 0.30, indicating a small effect on satisfaction (table 6). The mean differences for experience of making an appointment (1.79, 0.84 to 2.75) and overall experience (1.13, 0.50 to 1.76) were larger than as estimated in the regression models and using propensity score matching, but effect sizes remained small (standardised mean differences 0.25 and 0.26). In the General Practice Patient Survey 2013–2014, most respondents were satisfied with the opening hours of their general practices and had good experiences of making an appointment and of their practices overall. Most general practices participated in the extended hours access scheme. Random-effects regression models, propensity score matching and instrumental variable analysis all estimated the associations between scheme participation and patient experience measures to be positive but small. The association with satisfaction with opening hours was greatest for employed respondents who were unable to take time off work to see a GP, but this group still had substantially worse experiences across all measures. Results were generally consistent across regions of England. We suggest four strengths of the study. First, the study addresses two of the most prominent topics in current health policy in England—extended opening hours and patient experience of general practice. Second, we evaluated their relation using national data sets that include almost all general practices, such that the results are highly relevant to central government policy. The General Practice Patient Survey itself is monitored by government to assess NHS performance20 and by practices to set opening hours under the extended hours access scheme. Third, extended opening hours policies remain largely unevaluated. This paper is the first national analysis of such a policy and the first to use general practice payment data in this context. Fourth, using the multilevel structure of available data, we adjusted results for observed differences between patients and general practices and also tried to adjust for unobserved differences in the instrumental variable analysis. We thus tested the results' sensitivity to model assumptions and found consistent results across models. A limitation was that the payment data do not indicate exactly when practices were extending their opening hours during the week. To our knowledge, valid national data on the exact opening times of practices do not exist; data reported by practices on an NHS information website are inaccurate.9 A telephone survey of a nationally representative 4% sample of practices suggests that around half of extended hours with GP face-to-face consultations are after 18:30 on weekdays (1.4 of 2.6 hours each week; 0.9 hours at weekends; 0.3 hours before 08:00).9 Other health professionals are also eligible to provide consultations under the scheme. Cross-sectional studies are often limited by residual confounding. In this study, observed characteristics of patients and general practices were very similar between scheme participants and non-participants. Given this fact and the high rate of scheme participation, we do not expect potential sources of residual confounding to have important effects on the results. This includes possible non-response bias in the General Practice Patient Survey; response rates were similar between participation groups (36.9% and 37.2%). Instrumental variable analysis, which attempts to explicitly address unmeasured confounding, produced similar results to other approaches. Several explanations for the results that do not relate solely to the effect of scheme participation cannot be ruled out using a cross-sectional design. The scheme's introduction in 2008 could have improved patient experience in the short term, with extended opening hours increasingly part of normal expectations over time such that the effect has since reduced. Experiences in participating practices before they joined the scheme may also have been worse than the current experiences in non-participating practices. These alternative explanations, if true, would mean that the results presented underestimate the effect of the extended hours access scheme. A longitudinal study design was not feasible given the novelty of the extended hours access scheme data. The analysis was limited to three experience measures that we thought were the most relevant to current policy. Associations with other experience measures may differ, however. In a supplementary analysis (requested in the journal review process), we estimated a multilevel regression model for an additional outcome measure relating to appointment convenience. This measure had five levels: no appointment, not at all convenient, not very convenient, fairly convenient and very convenient (interval scale from 0 to 100). The adjusted association with scheme participation was 0.55 (95% CI 0.21 to 0.90), again indicating a minimal difference. The UK health secretary has stated that ‘the role and purpose of seven day primary care is about much more than convenience—it is about making sure precious hospital capacity is kept clear for those who really need it’.2 Several national studies of the General Practice Patient Survey linked to hospital data suggest that general practices with greater access (relating here to the ability to get an appointment) have lower adjusted rates of both emergency department visits and emergency hospital admissions.58–68 However, the extent to which residual confounding explains these results is unknown; more robust longitudinal analyses are needed.47 There is likely to be much variability in the extent extended opening hours schemes improve access and for whom. Programmes to extend opening hours in Manchester had a limited effect on use of emergency departments and patient experience, with results changing across model specifications and by local area.69 In London, four general practices that began opening 7 days a week reduced use of emergency departments relative to a local control group.70 The national evaluation of the first wave of the prime minister's GP access fund did not use methods that were adequate to determine its true effect on patient experience or use of hospital services.71 It did, however, identify little demand for appointments on Sundays in most pilots with some no longer opening on these days.71 National research funders should commission relevant academic evaluations. Our results suggest that the extended hours access scheme has a limited association with patient experience. Assuming that this association represents the true effect of the scheme, possible explanations include that it is difficult to improve experiences beyond existing levels (diminishing marginal returns) and that some participating practices are redistributing appointments rather than offering more of them (contrary to scheme requirements). Alternatively, patients who use extra appointments may often not reflect this in their reported experiences despite the benefits gained; critical respondents, for example, may remain negative for reasons besides service provision. Many patients may simply be unaware of their practices' opening times, preventing extended hours from translating into improved satisfaction. The extra appointments may also be used by patients whom the intervention is not targeted at, such as those not in full-time work, who could otherwise get an appointment for another time. Our results do suggest that patients who are unable to take time off work to see a GP could benefit more from extended opening hours, however, which supports the mechanism expected to link extended hours to improved satisfaction in the General Practice Patient Survey. The modest associations reported could instead be due to the limited size of the intervention—the minimum requirement of 30 min of additional appointments per 1000 registered patients each week is not a large change to opening hours for an average practice (equivalent to 3 hours and 45 min). It may represent an even smaller change to the number of additional consultations provided, and these consultations may not be with patients' preferred health professionals. Since additional appointments can be provided concurrently (for at least 30 min) to meet the minimum requirement, actual opening times may also not change that much. Revisions to the scheme may improve its benefit. The national evaluation of the GP access fund pilot areas reported that 75% of appointments outside core times were used. It therefore cautiously suggested that around 30 min of extended hours per 1000 population per week would be optimal.71 This is the minimum set in the extended hours access scheme, which suggests that this scheme may be sufficient alone to extend hours suitably. It remains to be seen whether utilisation increases with time, however, and what the results from the second wave of pilot areas are. Government plans for access to general practice appear unlikely to change soon. When once asked about the aim of 7-day working, the UK health secretary replied, ‘Increasing convenience for the general public in terms of being able to make routine evening and weekend appointments is a manifesto commitment that this government made, so we have to honour that’.1 Improving patient experience has been given as one of three key objectives for these changes.71 In conclusion, this study questions whether large improvements in patient experience will be achieved through existing changes to opening hours alone.
. Access to general practice in England: political, theoretical and empirical considerations. Br J Gen Pract 2016; [In Press].
. Preferences for access to the GP: a discrete choice experiment. Br J Gen Pract 2006;56:743–8. Contributors TEC conceived and designed the work, acquired and analysed the data and wrote the article. MH and AM contributed to revision of the analysis plan, interpretation of the data and revision of the article. All authors gave final approval of the version to be published. TEC is guarantor. Funding This report is independent research supported by the National Institute for Health Research (NIHR) (Doctoral Research Fellowship, Thomas Cowling, DRF-2013-06-142). The views expressed in this publication are those of the authors and not necessarily those of the NHS, the NIHR or the Department of Health. Ethics approval Approval was obtained from NHS England to use General Practice Patient Survey data for research purposes.